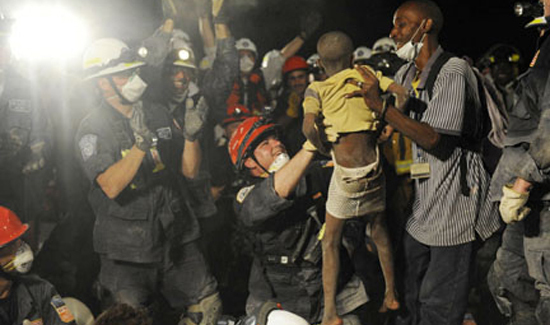 Following the devastating earthquake in Haiti, in January 2010, Rich holds up seven-year-old Kiki after five hours of removing debris and tunneling underground with his FEMA Team, New York Task Force One. Ed. Note: This is the story of the emotional turmoil an officer goes through when he’s forced to take a life to save the lives of others. It is among the most difficult things that can befall officers during their careers, and some never recover emotionally. The following is the story of NYPD Officer Rich Miller, who was put in unfathomable position, and was forever changed in the process. Send it to everyone you know outside of law enforcement who needs to better understand the terrible demands the job can have on those who have chosen to serve and protect. The following is an excerpt from the pages of Brave Hearts: Extraordinary Stories of Pride, Pain and Courage by American Police Beat publisher Cynthia Brown. Rich Miller risked his life many times during his career, but never more so than when he ended what is still one of the worst gun battles in New York City history. At great risk to his own life, he charged a gunman who had taken cover in a stairwell of a home in Brooklyn. By the time Rich got his shot, the man, who had failed the psychological exam to become a New York City police officer, had severely wounded five cops. Before he began his shooting rampage, he told his family that his goal was to kill as many police officers as he could before they killed him. Seconds later a sergeant from ESU headquarters was calling on the radio. He told Rich to get his rifle and go quickly to 16 Parkway Court in Brooklyn. Three people had gone to their local precinct in Sheepshead Bay and told the police a family member had assembled an arsenal of weapons and thousands of rounds of ammunition. He was threatening to kill as many New York City police officers as he could before they killed him. Arthur Alalouf, a former Marine and corrections officer, had wanted to join the NYPD, but when he flunked the stringent psychological tests required of all new police officers, he wanted revenge. Minutes after the family’s disturbing visit, Emergency Service officers, armed with heavy weapons, ballistic vests, helmets, and bunkers—the Kevlar-enforced shields that cover the top of the head to below the groin with a bulletproof glass port at eye level—were dispatched to the Alalouf home. In 2010, Rich was severely injured trying to subdue an emotionally disturbed person in a psychotic state. He and his fellow officers chased the six-foot-two, 270 pound man from the Bronx all the way to Manhattan. During a violent struggle under a subway car, Rich tore his bicep. It was a career-ending injury. Bunkers positioned, firearms drawn and ready, a team of four officers led by Gregory John approached the house. Their mission was to isolate and contain Alalouf. The first order of business was to secure the doors so the suspect could not escape. Greg John and Dave Isaacson moved quickly to make sure a door on the side of the house was locked from the outside. Before they got there, shots rang out. As Greg John dove for cover, the side door of the house moved slightly. Greg thought he saw the barrel of a shotgun protruding through the door. But as fast as it appeared, it was gone. He kept watching the windows and doorway, hoping to get a glimpse of the shooter. Seconds later another round went off, but this time it was coming from the second floor. Greg looked up and saw a terrifying sight. The shooter was standing in a window, calmly smiling down at him. The next thing he remembered was a muzzle flash just before bullets from the shotgun blast tore into his left shoulder. Wounded and bleeding, Greg pulled himself up. As he made his way around the corner of the house, he was able to fire off a few rounds from his Heckler & Koch MP5, but the man was gone. Clutching his bleeding shoulder, Greg staggered out to the street where Dave Isaacson was waiting. Dave picked Greg up in his arms and carried him to a waiting ambulance. The quiet neighborhood was now a war zone. With red lights blinking and sirens wailing, scores of cops pulled up. Over forty ESU officers were there in their trucks along with some of the highest-ranking people in the NYPD, including the Chief of Patrol and the Chief of the Department. TV news helicopters, hoping to get footage for their broadcasts, circled overhead before they were shooed away by a Department chopper flown to the scene by Sergeant James Cohan, a pilot with the NYPD’s Aviation Unit. To the bystanders, reporters, photographers, and television news crews who were arriving in droves, the scene must have looked like chaos. They probably never noticed that the police had already established a crime scene perimeter around the blocks that surrounded the Alalouf home that restricted access for everybody except the cops. Once the police lines were up and the perimeter was secure, a team of officers quickly went door to door, evacuating terrified residents. Outside the perimeter, another team was directing traffic and keeping the narrow streets open so police cars, ESU trucks, and ambulances could pull in close if needed. * * *As Greg John’s ambulance pulled away and the EMTs worked furiously to stabilize the wounded officer, Rich Miller and Joe Ocasio pulled up to Parkway Court. Sergeant Joe Malteso was waiting for them. Rich was one of the department’s top marksmen, and Malteso knew he was going to need someone with those skills today. The sergeant told Rich to set up an observation post on top of the nine-story building across the street. After describing the suspect, Malteso warned Rich to keep his firearm ready. Rich manned his post on the roof of the building for close to two hours before the sergeant sent another officer up to take his place. Malteso had chosen Rich along with Dave Kao, Andy Nugent, and several other key ESU officers to be on the entry team and search the house. While every one of the four hundred officers assigned to ESU is a certified emergency medical technician, some are also paramedics and physician’s assistants. Dave and Andy had advanced paramedic training. With the possibility that more cops were going to be wounded or worse, commanders knew they needed their most experienced SWAT officers to stop the gunman and be ready to provide life-saving medical treatment as well. When there is a serious threat from an armed assailant and the police breach the door to make entry, the officer at the head of the line is always the most vulnerable. With his bunker for protection, the first one in is expected to provide cover for the other officers who follow. The pressure was palpable. Every man on the team was aware that their friend and colleague Greg John might be dying. It was on them to bring this rampage to an end. The plan was to clear the first floor, then the second. The basement would come last. As soon as they were inside, the cops planned to pull the pins and toss their flash-bang devices. If Alalouf was still in the house, the bright light and loud noise emanating from these loud, smoky, but harmless grenades might give them seconds of valuable time. Just seconds before they went in, Rich realized there was a flaw in the plan. If the shooter was in the basement and armed with a semiautomatic rifle, he had the firepower to shoot straight up through the floorboards and kill the entire team as they searched the first floor. Rich urged the men behind him to move fast along the hallways and not to bottle up in the doorways. It was getting dark. Without some natural light, the search would be more difficult. As they fastened their Kevlar helmets and readied their bunkers and firearms, the team got into position. “God,” Rich prayed. “Help us get through this.” It was one of the few times in his twenty-two-year career he could remember asking for God’s help while he was on duty. It was a little after seven o’clock at night when the lieutenant gave the signal. The breaching team busted through the door. Five hours had passed since Greg John had been shot. 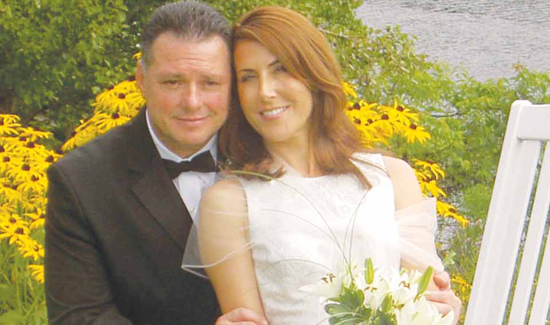 Rich and his wife, Theresa, on their wedding day. Once the distraction devices were thrown, a brilliant white light flashed, an ear-shattering explosion rocked the house, and the first floor filled up with dust. Body bunkers placed strategically to protect their heads and torsos, weapons in hand, the officers made their way quickly over the first floor. After a thorough search of the rooms, they went upstairs to the second floor as Rich waited and secured the hallway leading to the basement. Once the second floor was cleared, they went to the basement. Rich was the lead bunker man in the progression. After checking all the rooms in the basement and conducting a secondary search, the officers were confident Alalouf was not in the house. As Rich and his team moved to the backyard to get their next assignment from the commanders who had gathered there, another team of six Emergency Service officers began a methodical, house-to-house search on the next street. As they checked the homes on Avenue Y, whose backyards faced the rear of the attached row houses on Parkway Court, the officers noticed a door ajar at 523. Quickly, they formed an entry team. Officer Joe Guerra took the lead position as bunker man. Everyone checked their weapons and lined up in single file. Guerra gave the signal, pushed open the door, and yelled “Police!” before taking a few steps inside. The instant Joe was fully inside the house, a muzzle flash went off, followed instantaneously by an ear-shattering boom. Arthur Alalouf was waiting for them. Bullets tore into Joe Guerra’s face, but even with blood streaming down his nose and cheeks, somehow he was able to keep hold of his bunker. As he took a few steps toward the gunfire, the shooter fired off another round that ripped into his upper thigh and hit his shield. The force of the round was so intense, it knocked the bunker and his gun out of his hands. With no shield and no weapon, he was now helpless in the face of the rounds that just kept coming. The last thing he remembered was getting hit in the leg. Bleeding profusely, Guerra lost consciousness and collapsed. Jimmy McGrath was behind Guerra. In his statement to Department investigators following the incident, McGrath said he was about to enter the house when he heard an explosion. Seconds later when a muzzle flash exploded, McGrath was sure Guerra was hit. 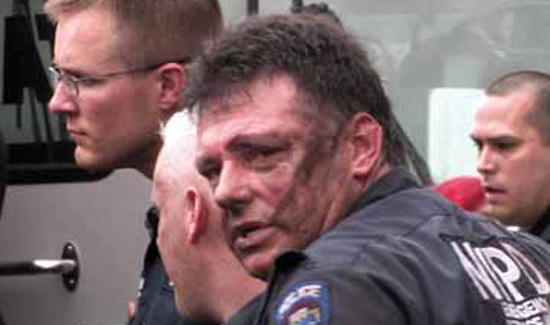 McGrath tried to get to his wounded colleague, but when he was just a few feet away, a bullet ripped into his face. Jimmy slumped to the ground, and Bill Madigan carried him out. Once Billy had carried McGrath to safety, he turned around and went back into the gunfire, hoping he could help Guerra. What Rich and Joe didn’t know was the gunman was setting firing points and fields of fire so he would be perfectly situated to kill them as they approached. * * * The Sheepshead Bay neighborhood is a dense grid of attached row houses. At the time each home had a deck in the back with a small grassy area backing up against the backyard of the house on the next street. Chain-link and wooden fences separated the yards. The chain-link fences were a little over four feet. The wooden fences were double that height. Rich sprinted down the backyards, leaping over the fences he found in his path. His speed and agility were remarkable, considering he was carrying over fifty pounds of extra equipment, including a heavy ballistic vest, a Kevlar helmet, a body bunker, and two 9mm semiautomatic handguns. He ran down the length of the backyards toward the gunfire. When he got to the end, he cleared the last fence, crashing down in the middle of a tangled mess of tomato plants. The gunman was watching Rich the entire time. When he leapt over the fence separating the two men, Alalouf released two dogs. One was a pit bull. As Rich pushed his way through the tomato plants, he was startled to see two dogs running toward him. He had been around dogs his entire life, and for a split second he thought he should wait to see if they were going to attack. But his experience coupled with the rapidly unfolding events told him not to take any chances. In the split second it took to aim his firearm, the dogs were at his feet, snarling and snapping. Rich shot one of the dogs, and they both scurried away. The sun was going down. A light rain was falling, and Rich realized he had lost track of Joe Ocasio. He was still clutching his bunker, keeping it positioned to protect his head and torso as he pushed his way through the plants. He looked around but he couldn’t see anyone. When Rich was running toward the source of the gunfire, he wasn’t sure exactly where his opponent was positioned. He had no way to know how much ammunition the gunman had left, but from the looks of the arsenal they had found in his house and the sounds of the rounds flying through the air, Rich assumed he was still well stocked. 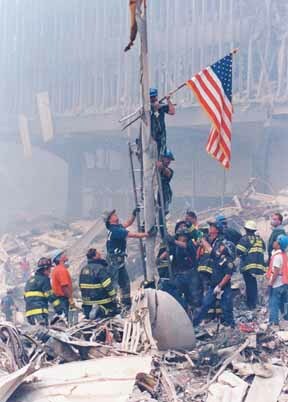 Miller raises the first American flag at Ground Zero the day after the terrorist attacks of Sept. 11. His eye caught something. At first he thought it might be an animal. But when he looked closer, he realized it was Arthur Alalouf hunkered down in a stairwell leading into the basement of the house next door. Only twenty feet separated the two men. The gunman was positioned perfectly for his mission. Tucked down below the back deck in a stairwell surrounded by a three-foot cement retainer wall, it was going to be easy to take down the police officers who were coming to get him. He had planned his reign of terror down to the last detail. Rich was alone on the deck of the home on Avenue Y. Alalouf was in the stairwell next door. He dropped the gun and pulled his backup weapon. As he was getting ready to fire, Joe Ocasio appeared, completely out of breath. Rich found out later that one of the pit bulls had attacked Joe when he jumped over the fence. It took several minutes for Ocasio to deal with the dog and then weave his way back through the yard. As he cleared several obstacles, he realized he could not see Rich. Ocasio fired the rifle, but he couldn’t get Alalouf, who kept on shooting. A third officer, Bill Fisher, appeared. He was armed with a Mini 14 as well. Rich said the first time he realized there was a third cop was when he heard someone yelling at him to get out of the line of fire and pushing him up against the back wall of the house. Despite the distractions, Rich kept his gun pointed at the stairwell. He pushed Fisher away and whispered over to him. “Wait. Wait. I think I can get him now.” He kept firing but the rounds kept hitting the walkway around Alalouf. Knowing his magazine was almost empty, Rich decided to take the risk and reload. Hoping Alalouf wouldn’t see him, he tried to move a barbecue grill for cover and get a better angle, but it was screwed into the deck and he couldn’t budge it. Totally exposed, he dumped the empty magazine while yelling, “I’m out. I’m out.” A year later when Rich became a tactics instructor, he realized this was a bad phrase to use. He was almost finished reloading when Alalouf rose out of the stairwell. His 12 gauge shotgun was pointed directly at Rich. A split second later, another round smashed into Rich’s ballistic shield. A desperate attempt to keep his hand clenched around the bunker handle failed. The shield, his only protection against the fusillade of bullets coming at him, went flying. At the exact time Rich lost his bunker, Joe Ocasio, who was crouching down on the deck to his right, started screaming. At that point Rich had no bunker, and he was almost out of ammunition. He summoned all his energy and tried to concentrate. He pushed himself up against the back wall of the house and looked down on the stairwell. Billy Fisher crouched down and made his way toward the bleeding body of Joe Ocasio. The bullets were flying. Just as Fisher reached Ocasio, he felt a round tear into his leg. Holding his hand over the wound, he managed to drag himself and Joe to the front of the house where waiting ambulances rushed both officers to the hospital. Now it was just Rich and Alalouf. Rich knew only one of them was going to get out alive. With his adversary sitting in that position, Rich hoped he had a better angle. He fired, but Alalouf quickly moved to his previous position, crouching down in the corner against the retainer wall. They were back to square one. Rich stood there, alone, as Alalouf tried to reload. Their eyes met. Alalouf rose up a bit, and Rich could see he was totally exposed. Quickly, the gunman crouched down against the retainer wall in the stairwell, but most of his back was still visible. As Alalouf continued to try and reload his shotgun, Rich fired a shot. Alalouf groaned and slumped back down into the stairwell. Rich stood perfectly still looking down from the deck. Hoping it might be over, he looked around and wondered where Joe and Billy were. At that same moment, Alalouf rose up and fired again. The round whizzed by Rich’s head. Rich hopped the fence to the neighboring yard where Alalouf was still crouching in the stairwell. Alalouf jumped up and fired a shot where Rich had been positioned just seconds before. The round came in below the deck right at McGee and Welch. Alalouf crouched down again, unaware that Rich, like a tailback running a Green Bay sweep, was coming at him from a wide angle. As he closed in, Rich hoped Alalouf would be distracted by McGee and Welch. In high school, Rich ran the forty-yard dash in 4.6 seconds. In his desperate sprint to come back up on the shooter, he is sure he broke his record even carrying all his gear. It was only minutes after the bullets stopped flying that word spread that five officers were wounded, and no one knew if any of them would survive. Everyone at the scene who could, took off for the hospital. When they pulled up to the emergency room entrance, reporters and camera crews were everywhere. The Police Commissioner and mayor had arrived along with distraught family members and friends of the wounded officers. The wounded officers survived. Joe Guerra, Jimmy McGrath, and Joe Ocasio suffered the most serious wounds and were forced to retire because of their injuries. After several months of surgeries and recuperation, Greg John and Billy Fisher, both of whom wanted to return to work, were also forced to end their careers with the New York City Police Department. By the time Rich got out of the hospital and returned to Truck Four in the Bronx to get his car and drive home, the sun was coming up. He had called his wife around midnight to tell her he was okay. Nevertheless, she was relieved when she heard the car pull into the driveway. When he opened his front door and went inside, he was overcome with an urge to make sure his three daughters were safe. He went to each of their bedrooms and watched them sleeping from the doorway. He crawled into bed, hoping he could sleep, but the adrenaline rush was still intense and he couldn’t relax. After checking on the kids again and pacing around the house, he laid down on the living room couch and shut his eyes. That was the first time he saw Arthur Alalouf. He was staring at him the same way he had right before he died. Rich was raised a Catholic, and while he has had his issues with the Church, he has a strong faith in God. He has made it a habit to thank him when life is good, and he has prayed for help when times are tough. He did not know his new parish priest very well, but he had nowhere else to turn. Rich got to the point. He told the man he wanted to compose a prayer. “I explained that usually I had no trouble making my own prayers, but this time I needed some help.” The priest recalled the front-page news reports and seemed eager to do what he could. Rich told the priest that first he wanted to thank God for letting him live. Then he asked for a prayer for his fellow officers who were still in the hospital recovering from their wounds. Finally he said he needed a prayer for Arthur Alalouf. He wanted to ask God to let his soul rest in peace. The priest asked Rich to kneel. He stood above him and put one hand on his bowed head. He thanked God for keeping Rich safe. He prayed for the quick and complete recovery for the brave police officers who were wounded and still in the hospital. Finally he prayed to the Holy Father to let Arthur Alalouf’s soul rest in peace. When Rich stood up, he felt calmer. His pulse had slowed, and his breathing was deeper and more steady. He shut his eyes. It was the first time since Saturday that Arthur Alalouf was not looking back at him. When the gunfire stops and the assailants are dead, wounded, or under arrest, it should be over, but it’s not. In many ways, for the officers who were involved, the hardest part is ahead. After every incident where shots are fired and people are wounded or killed, every law enforcement agency has strict procedures and policies concerning the follow-up investigation. In New York City, everyone on the scene who fires his weapon submits a detailed report and is questioned at length by officials from the Department’s Internal Affairs Bureau. It is the job of Internal Affairs detectives and their supervisors to determine that actions taken were warranted and in compliance with the strict guidelines all officers must follow when it comes to using deadly force. After that comes the internal Department critique—a roundtable discussion that includes all the people who played a role in the incident, including all the supervisors up to the Chief of the Division. The Department scheduled its first no-holds barred critique of the incident just four days later. Following a detailed, step-by-step review of the entire incident, officers discuss which tactics worked and which ones failed. Those found to be in violation of Department policies on the use of excessive force are reprimanded. Supervisors who made decisions must explain their actions. It is a classic Monday morning quarterbacking scenario. Sometimes it is a productive process where a frank discussion of mistakes means a better job is done the next time. But just as often, the critique turns into an ugly slugfest replete with the recriminations and blame that inevitably occur when five officers are seriously wounded by one man in an incident lasting over six hours. Difficult questions are raised. Who ran? Who stayed? Who left a wounded comrade because they were afraid? Over the course of his career with the NYPD, Rich has been an enthusiastic proponent of these Department debriefings. But when the bosses wanted to sit down and hash out the Alalouf incident just four days afterward, Rich was adamant the timing was wrong. Rich suggested to his supervisors, including the Commander of Emergency Service, that it might be wise to postpone the meeting. His warning went unheeded. On the Wednesday after the gun battle in Brooklyn, the debriefing session was held as scheduled. Questions were raised about who left Joe Guerra after he was wounded. Someone else asked why so many cops were out in front of the house taking cover behind police cars or running down the street away from the mayhem once the shooting started. One officer said he heard someone say, “Don’t go in there. They’re shooting at us.” The meeting degenerated into a barrage of hostile questions and defensive answers, most of which were never answered. One officer reported there was so much tension in the room you could feel it pressing against you. Eventually Rich Miller was awarded the Combat Cross, the NYPD’s second-highest medal, for his heroic actions the day Arthur Alalouf decided to kill New York City police officers. When the incident was further reviewed, everyone agreed he should have received the Department’s highest award for courage and valor, the Medal of Honor, for stopping what is still one of the worst gun battles in New York City history. For more inspiring stories and profiles of some of NYPD’s finest, pick up a copy of Brave Hearts: Extraordinary Stories of Price, Pain and Courage, available at Barnes and Noble, Amazon, and at www.braveheartsbook.com. You can also get information about using Brave Hearts as curriculum material. Over 40 law enforcement academies and colleges of criminal justice are currently using the book in their classrooms. A free 90-page lesson plan is available. Shoulda got the Medal of Honor! Incredible bravery and discipline! FIDELIS AD MORTEM!